Sasha Says Nails... I'm a Manicure Momma: Giveaway- Three China Glaze Purples! When Beauty Stop Online sent me some China Glaze purples to review, they offered to send me 3 bottles to giveaway as well! I really love the Draped in Velvet that you are wearing. I don't have any good purples. Ooooh.....China Glaze Flying Dragon, hands down. Love the Draped in Velvet! I love the Let's Groove! So stinkin' cute. I don't have a purple that I love. My favorite purple is Essie It's Genius. I like the Royal Tease. My favorite purple that I own is China Glaze Stella. I have an OPI purple that I've been loving lately, but I don't know what the name of the color is. Let's Groove looks super pretty. My favorite China Glaze purple is Flying Dragon, it's so so so pretty! 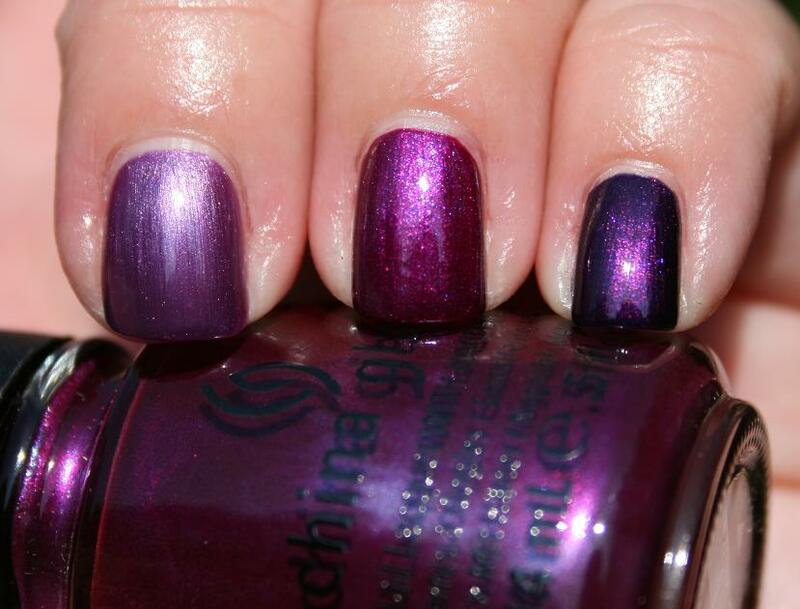 I like the middle one "Draped in Velvet"
Favorite purple polish? Am I really only supposed to pick one? Ha ha!! I don't have a purple yet. Maybe if I win this, I will have one! I don't have a purple either but need one. Lovely!!! Thanks for sharing Sasha!! My favorite purple polish is Zoya's Pinta. I love purple & the shades you're giving away are gorgeous, especially Draped in Velvet! I'd love to win! TY for the chance! I love the Draped in Velvet!! I like Let's Groove the best. I love Let's Groove. So pretty! I don't have any purples so these would make a great addition to my collection. Finger Paints Go Van Gogh. Makenna and I love all things purple! Pretty!! !